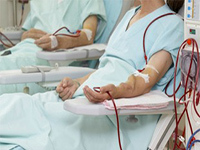 In medicine, dialysis (from Greek dialusis,"διάλυσις", meaning dissolution, dia, meaning through, and lysis, meaning loosening or splitting) is a process for removing waste and excess water from the blood, and is used primarily as an artificial replacement for lost kidney function in people with renal failure. 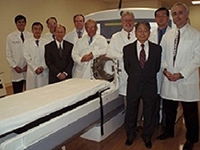 The Gamma Knife (also known as the Leksell Gamma Knife) is a creation of Elekta AB, a Swedish public company, used to treat brain tumors by administering high-intensity cobalt radiation therapy in a manner that concentrates the radiation over a small volume. 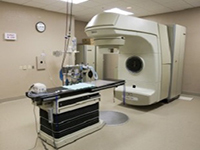 Radiation therapy, radiotherapy, or radiation oncology, often abbreviated RT, RTx, or XRT, is the medical use of ionizing radiation, generally as part of cancer treatment to control or kill malignant cells. Radiation therapy may be curative in a number of types of cancer if they are localized to one area of the body. It may also be used as part of adjuvant therapy, to prevent tumor recurrence after surgery to remove a tumor. 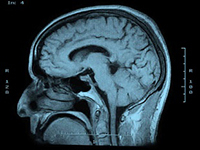 Magnetic resonance imaging (MRI), nuclear magnetic resonance imaging (NMRI), or magnetic resonance tomography (MRT) is a medical imaging technique used in radiology to investigate the anatomy and function of the body in both health and disease. MRI scanners use strong magnetic fields and radiowaves to form images of the body. 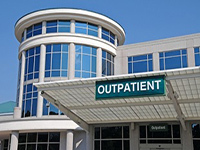 Outpatient surgery has grown in popularity due to the rise in outpatient surgery centers and improved technology. Outpatient surgery centers often allow patients to get medical surgery and cosmetic surgery done in much more luxurious settings than a state hospital and are often preferred by patients for minor surgical procedures.